Developing a deep understanding of who your influencers are is the first step towards building successful relationships. As you build your influencer network, you need to spend time researching and validating your influencers. How can I access an influencer profile in Traackr? A complete influencer profile is available for any influencer who has been added to your account and projects. What type of information is available in an influencer profile? The job title, company, and bio give you a quick overview of their credentials. Their Reach, Resonance, and Relevance scores help you determine their influence level. How their content performs on average across individual platforms. Searchable full content shows you what they publish or share across social platforms and lets your drill down to the most relevant posts. 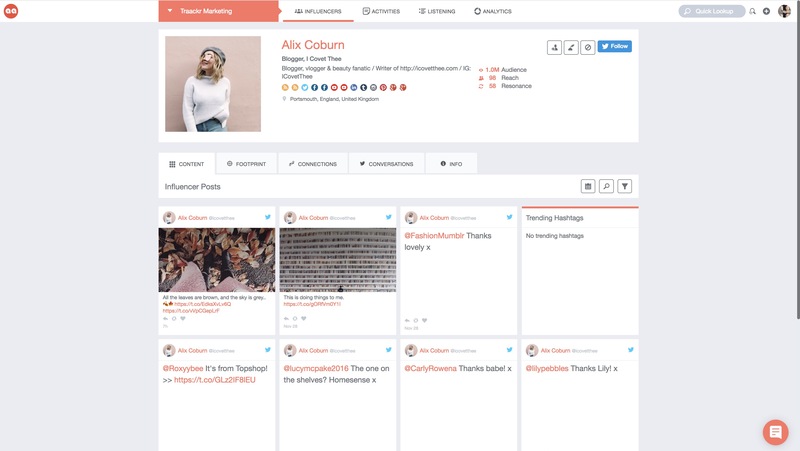 A complete online footprint of all platforms where the influencer publishes (and associated metrics) help you their entire online presence, and audience metrics on different channels. Audience insights help you understand who your influencers are talking to and if their audience is aligned with your ideal customer. Understanding the influencer's connections and network helps you determine who influences your influencer and who they influence. The conversation history shows if there are current social interactions between the influencer and your brand or team. Contact details help you see the best ways to get in touch. For newly uploaded influencers, it might take up to 48 hours before complete profile information will become available. How can I leverage this information? With this information at hand, you’ll be able to assess the role and impact of an influencer in an online conversation, validate their influence, and outline your engagement strategy with them. Where are they most engaged? What messages (will) resonate with their audience? Where would they see value in interacting with your brand? Answering these questions helps you think about how engaging with them can ultimately support your business objectives.